Maple sap collecting is a great way to get out of the house at the end of a long winter. This kit provides an easy way to tap your maple trees. You will need to provide your own buckets or water jugs. You will also need a cordless drill. Our enclosed Quick Start Guide booklet will lead you through the basics of making Maple Syrup. This easy to use Maple Tapping kit uses durable and tough nylon taps. The taps come preassembled to 36" lengths of top quality Max Flow Flex polyethylene drop lines. 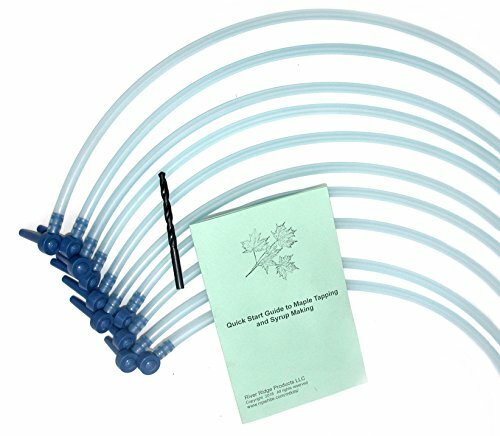 Kit includes 10 tap/drop line assemblies, a 5/16" high speed steel drill bit and our booklet "Quick Start Guide to Maple Tapping and Syrup Making". If you have any questions about this product by River Ridge Products Maple Tapping Kits, contact us by completing and submitting the form below. If you are looking for a specif part number, please include it with your message.